While I was performing my standard Windows Update on my work virtual machine this morning, I wondered if the promised Internet Explorer 8.0 release to Windows Update had been dropped. I switched to my test-bed, vanilla Windows XP virtual machine, ran Windows Update, and PING! Up it came. The masses of people who blindly do what Windows Update tells them to do will now be installing Internet Explorer 8 on their machines. The interesting thing is that the only piece of software that Windows Update said was a critical Update was Internet Explorer 8.0. 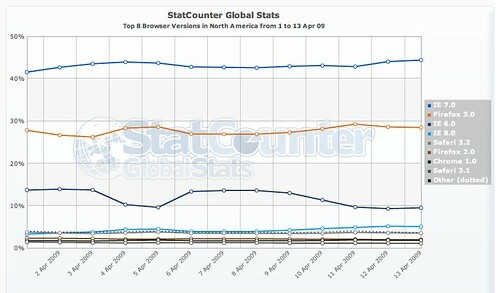 Given that it would be replacing Internet Explorer 7.0 on my virtual machine, how bad was Internet Explorer 7? Are they trying to push MSIE6 and MSIE7 out of the way ASAP? Today should see a large number of new installs of Internet Explorer 8, either on purpose or inadvertently by those folks who install everything that Microsoft tells them to. I will be monitoring StatCounter’s GlobalStats over the next few days to see if there is a spike in, most notably, US installs of Internet Explorer 8. I can’t make a lot of comments about the quality of browsing experience in one version of Internet Explorer over another; I have been a dedicated Firefox user on Mac, and a Safari user on Windows (yes, that is weird) for a while. But the desire to move as many people as quickly as possible to a new browser speaks volumes to where Microsoft thinks the Web is going. And they realize that it is not going in the direction that its older browsers had been taking it. UPDATE: A colleague forwarded me this article on the release of Internet Explorer 8 to Windows Update. Effectively, you still have to go through the Web interface and agree to download the new browser. It’s not being pushed down onto Windows users through the automatic update built into the OS, no doubt to placate the glacially-slow IT departments I mentioned here. Internet Explorer 6.0, that infamous dinosaur from the dark ages of 2001, is still with us. And on occasion, I have hinted that this is the result of the biblically-slow pace of change in large corporate IT departments. Well, now I have proof of this. Using data from our good friends at StatCounter, this graph leaped from the screen and nearly exploded my mind. The pattern in the data is clear, if you are paying attention, which I haven’t been. The dips that appear in the Internet Explorer stats occur on weekends. That means that many of the Internet Explorer 6.0 users are only using it because it is forced on them by their IT departments. Dear IT professionals of the world: Internet Explorer 6.0 is an exploit waiting to happen and a barrier to inventive Web development. Please upgrade. Thank you. In the previous installment in this series, I looked at the browser share in North America. Across the water in Europe, the browser distribution metrics show the unique flavor that this continent brings to this fluid arena. 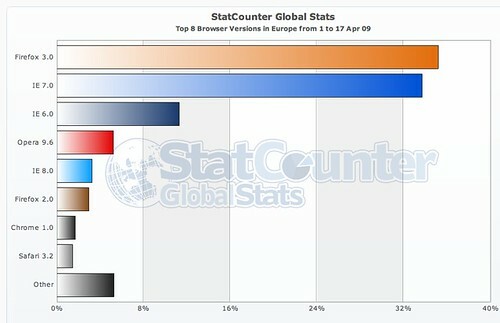 In Europe, MSIE7 and Firefox 3 are effectively tied for the lead as the most dominant browser, followed distantly by MSIE6. As in North America, MSIE8 has substantially increased it’s market share since its March 19 2009 release, but it has not caught up to Europe’s favorite son, Opera 9.6. What is clear is that MSIE8’s gain is MSIE7’s loss. Comparing March 1-19 with April 1-19, the shift away from MSIE7 is almost equal to the shift to MSIE8, meaning that people that are upgrading to MSIE8 in Europe are doing so, in the most part, directly from MSIE7. There is little or no change to the MSIE6 install base, indicating that this is an entrenched population, likely in large corporations or government agencies. Like in North America, the big factor to watch is how quickly the MSIE6 population decreases. 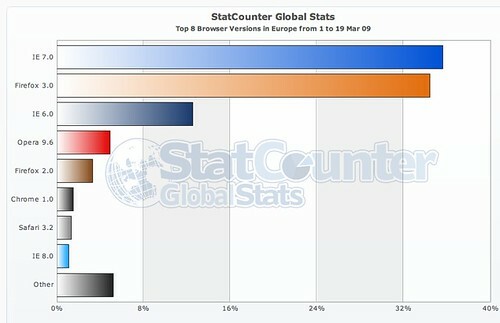 Europe already has an entrenched population of alternative browser users, mostly with Firefox 3. 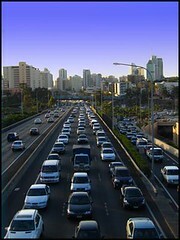 When Opera 10 and Firefox 3.1 are released, it is likely that these people will move directly to these browsers. What remains to be seen is how the strong anti-Microsoft sentiment in Europe affects the adoption of MSIE8. The call came this morning. It really wasn’t unexpected. Whenever I get one of those rare calls from my mother, I half expected the reason was to tell me that he had passed. It’s that aching feeling of tension that the ringing phone was going to tell me that he was gone. My grandfather and I were from very different worlds. He spent too much of his life underground. His knees, shoulders, hearing all showed that. His world was experienced through the muscles, the bones. His world was wrenched from the earth, shaped by his hands, pulled from the grime of machines. It was a world of men, a world that is as incomprehensible to me as mine was to him. I knew he was a ladies man. You know the one: Dashing, attractive with a strong temper and a brooding, unpredictable temperament. The man of mystery that all ladies ask about. He was faithful to one woman, my grandmother, until the day she died. Their relationship was a war between personalities, that explosive combination of friction and passion that made it one of the strongest bonds I have ever seen. He mourned her until the day he died. Whenever I visited, the discussion eventually drifted around to his Nettie. That distant look came over his failing blue eyes, the panorama of memory clearly playing on his face. My grandfather and I shared one thing: The powerful mood swings that were fueled by the same catastrophic failure of our brains to handle the world in a reasonable way. I found peace through medication. 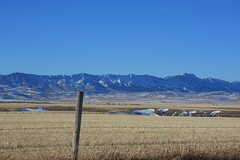 Grandpa started with the numbing power of rye to help take the edge of his mental anguish. And when he was forced to make a choice between the drink and his life, he chose his life and left the drink behind. 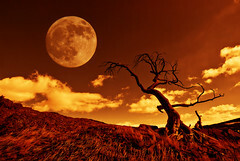 He took the restless energy that drove him to drink and channeled it into the furniture he restored. People from far and wide brought him pieces that were lost, beaten, destroyed. In his hands, their inner beauty was exposed. Each piece of furniture was a piece of his life that he was atoning for. A mistake that he was trying to repair. A memory he was sharing. Those memories are scattered now, among family, friends, strangers. And with each memory shared, he ensured that he would live on. His best gift to me was to help me realize that the mistakes of youth can be restored, repaired, but memory reminds us that they can never be undone. I miss you grandpa. Travel in peace. William A. Kinnear – 1919-2009. MSIE6 Euthanized. Rejoicing Among Web Developers Begins. 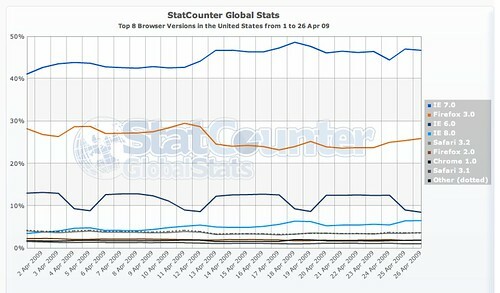 I discussed the slow decrease in MSIE6 browser share earlier today, but it is not occurring fast enough for my liking. It is a browser from what seems like a generation ago. UserLand was the primary blogging tool. Or a text editor. Is it too early to write a redirect rule to direct MSIE6 users to a page telling them to upgrade to view content? 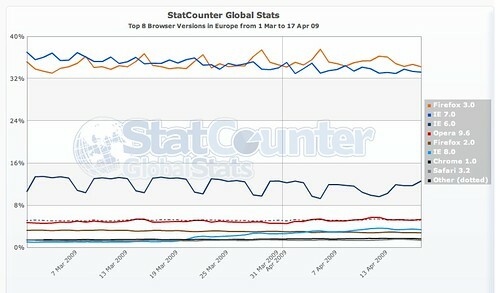 Tracking browser penetration and market share has become a new obsession with me. With 2009 shaping up to be the year of the browser container, the choices that people make will affect the development of Web technologies for the next few years. So far, the only new player to come out of the gate as a production release is MSIE8. Since March 19, MSIE8 has seen a slow and steady increase in market share, at least in North America. This has occurred, as I have noted previously, without the support of Windows Update, which will drive millions of users to automatically upgrade their systems. What can be seen in this data from StatCounter is that MSIE8 is finally (Thank [insert deity or supernatural object here]!) taking market share away from MSIE6. As the corporate browser of choice (mainly because IT departments don’t have the resources or initiative to sign-off on MSIE7), MSIE6 is the default platform that all developers are forced to lower their standards to. One can hope that IT departments will allow their customer base to make the leap directly to MSIE8 from MSIE6. We can all celebrate now, as the StatCounter data now shows that MSIE6 has dropped below 10% market share. What is more interesting is that Firefox 3.0 made a serious encroachment into MSIE7 near the end of March. I am not aware of what may have caused this, and would be interested to hear if the StatCounter team has any insight into why this may have occurred. A comment on my Hit Tracking with PHP and MySQL post raised some interesting questions about what a consumer of Web analytics data needs to consider when selecting providers for their sites. Most folks are familiar with the model of Web analytics vendors: You place their JS tag on your page which makes a call back to their centralized system with all of the data that can be collected about the visitor who has just come to your site. There are three items that you, the consumer of this third-party service, need to get straight answers about. Visitors to your site do not know which components you are responsible for and which you have farmed out to vendors and services. In their mind, all content is your content. This means that the performance of the Web analytics tag, which if not placed correctly on the page can affect the rendering of the content, is a critical factor in selecting a vendor. To my knowledge, none of the Web analytics vendors used by most people blog and social media firms (StatCounter, GetClicky, Google Analytics, Omniture, etc.) freely share response time and error rate metrics of their tag infrastructure with the world as measured by a third party. Is the tag delivered from a central location, or does the provider use a CDN? Is the data delivered asynchronously or synchronously? The download performance of the tag is not the only concern. Ask them to provide data on the average processing time that they see when a client parses and processes the code. How does this processing time vary from browser to browser, between OSs? What steps are they taking to ensure that the tag does not affect the perceived performance of your page? Ask for this data. Ask that the measurement data be collected by an impartial third party. Demand that this data be freely available to you before you make a decision on purchasing their service. All of these services rely on a JS tag to collect and deliver the data to their data warehouse. Ask the provider to tell you how large this tag is, and what steps they have taken to reduce its size so that it has a limited effect on the download of your content. Have they minified the tag? Is it delivered using HTTP compression to further reduce the size? Are ways to reduce the size of the tag always under considerations? Analyzing data takes a couple of forms: daily operational views to spot changes or issues; and long-term trending to find larger patterns and major shifts in your visitors. As a result, data needs to be available with a substantial degree of detail while still providing aggregated data that allows larger patterns to be easily discovered. How long does your provider store detailed data? What is the data expiry policy? Can you extract the data and import it into your own database? Web analytics is key to determining what works and doesn’t work on your site. It tells who, where and how people are accessing your content. But without a Web analytics partner/vendor that provides performance and support, you may be left more in the cold than if you were just looking at your raw Web logs. From my IPV4 database, here are the the Registrar and Country statistics as of April 10 2009. Since the last update, ARIN has crossed the 1.6B IPV4 address boundary, adding nearly 5M IPV4 Addresses. APNIC matched this growth by adding an additional 5M new addresses of its own. The majority of the growth in APNIC continues to be driven by China, which added an additional 4M IPV4 addresses since March 14. As China’s Internet growth continues, the number of addresses assigned to ISPs in that nation will continue to grow. However, it is unlikely that China will equal or exceed the US mainly due to the movement to mobile devices, which will be managed using private IP space rather than public IPs.